and to investigate how altering parameters such as hip swing and roll can affect the type of gait produced. The information gained can be used in combination with visual information to guide robotic locomotion. 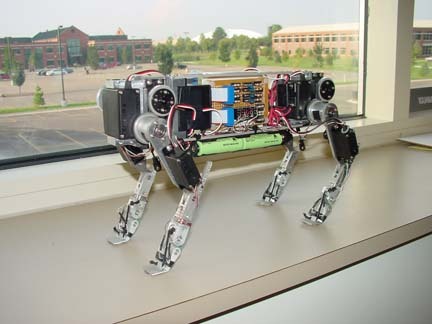 The Quadruped Robot (aka Tom Cat) from Iguana Robotics Fig. 7.2 uses limit cycle based motion control. Each paw of the Tom Cat had a pressure sensor on it and this sensor data was collected during locomotion. sequence. See Table 1 below and Figs. 7.3- 7.6.
observed in four legged animals such as cats and dogs. the knee and hip swing amplitudes to a high value with very low twist amplitude. lunge value contribute to the backwards sliding motion. longer reach when moving forward. upon the robots locomotion pattern. not have any limb momentum with which to push it forward or backward. placed on the supporting limb. high values tend to lead to instability. large negative value of -10.4 to a smaller value of -0.8 created significant increases in the speed.